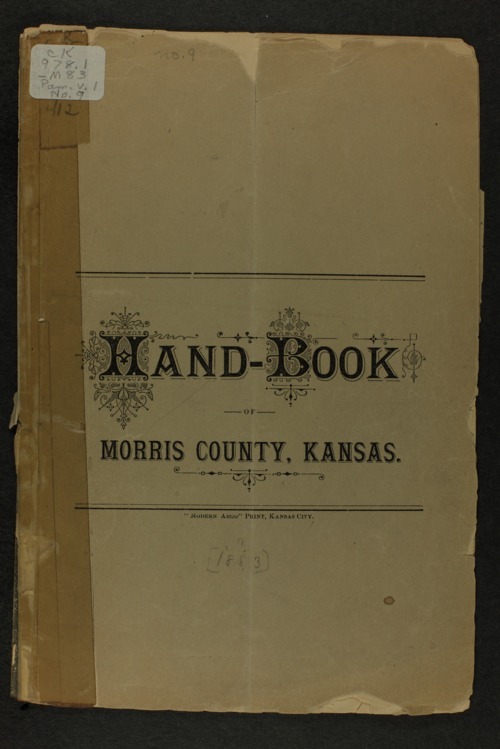 This handbook was published by the "Modern Argo" of Kansas City, to encourage settlement in Morris County, Kansas. This pamphlet has extensive descriptions of the land and resources in the county intended to encourage agricultural settlement by extolling the virtues of this 'famous and beautiful Neosho valley'. The text describes the natural resources available. It also describes a number of established farms such as Rock Creek Valley Farm, Spring Valley Farm, Diamond Spring farm and many others. Descriptions of several towns, their businesses, and other amenities are provided for Council Grove, Dunlap, Kelso, Parkerville, and White City. The booklet includes sketches of the Morris County Courthouse, Council Grove businesses, and homes and farms.